After a good sleep we were up and going relatively early. We met our friends for breakfast and then formed a plan for our morning. Dan brought his new underwater camera, but had forgotten the battery and charger, so he and I headed out to the north of the city to see if the more modern malls could provide a replacement. 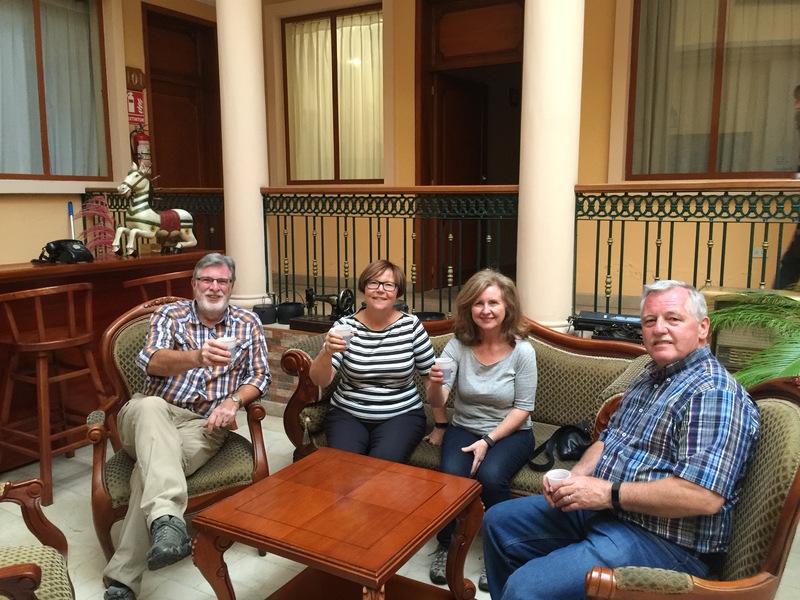 Glenn and Gwen decided that they would explore more of the city, namely the Ronda district. We agreed to meet up for lunch and off we all went. Dan and I were directed to the bus station where for 0.25$ each we took the bus north about 10 km! 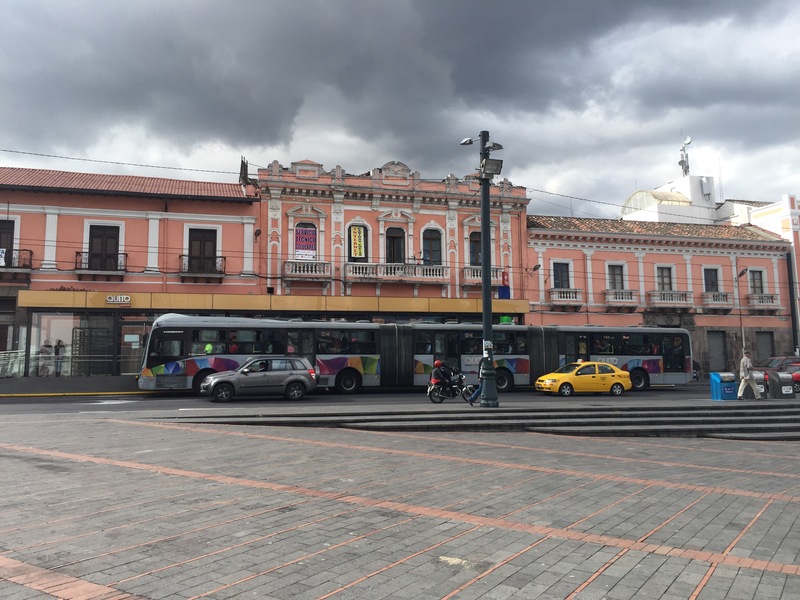 It was quite the experience as the bus was a triple articulated vehicle that could snake around even the tight corners in the inner old city. Dan also commented on being the tallest person on the bus…by a head! The ride was interesting and uneventful in its efficiency. Here’s an example of our bus! We got out at our stop and headed for the first mall, were redirected to a second mall where we scoured 9 floors of tiny shops wound around an ascending helix like walkway. No luck. Back to the first mall (it was open then) and we scoured that one. While it looked more promising, we found no luck there either. Then onto a third mall, a few long blocks away. When we walked in we saw shops for Bulgari, Tiffany’s, and a few other high end stores. We found a photography shop, but no luck there either. Oh well, we tried! Now for the ride back to meet up with G and G in the city centre. We got off a stop early to ensure that we wouldn’t be late for our meeting, and who should we run into at that moment, but G and G…about 4 blocks fro our meeting place. 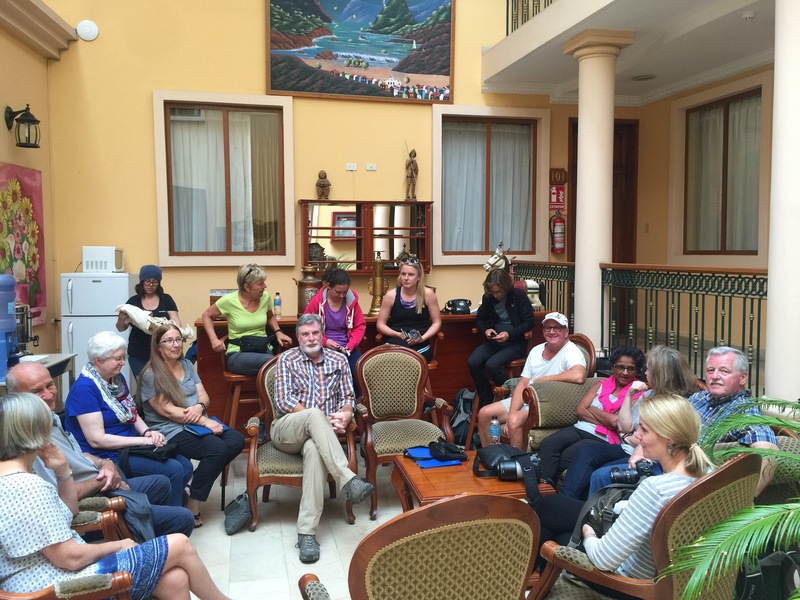 We wondered a little further together until we found a nice spot for lunch, then headed back to our rooms for a quick refresh before meeting with our tour group for the first time. At 2 pm sharp, the gang arrived. All in all there are 15 of us travelling together to the Galapagos tomorrow. We were given our instructions with a strict departure time tomorrow of 6 am. Yikes! I guess we’ll be having an early night tonight! We seem to represent the globe… at least as far as English speaking nations are concerned, with Canada, Australia, US and UK leading the charge! 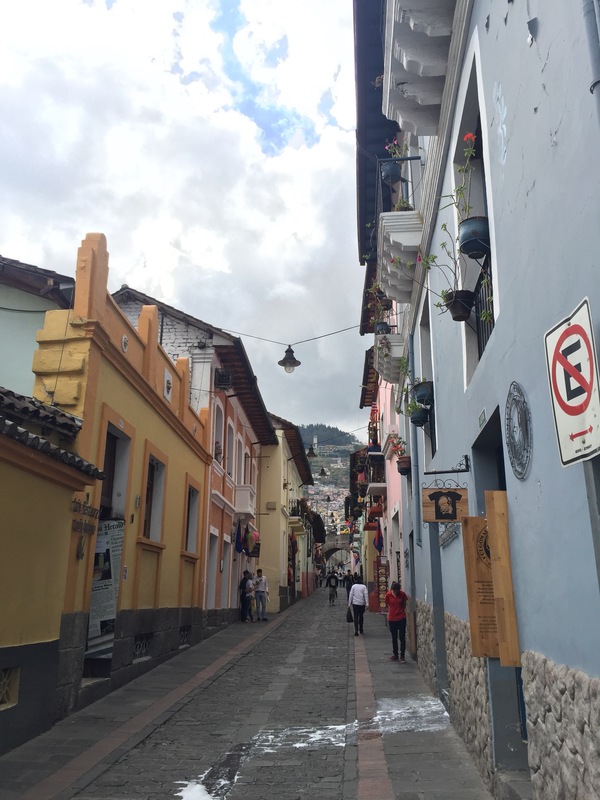 We were told not to expect much in the way of wifi, if any at all, so my blog posts may be saved until we make it back to Quito. Tomorrow’s plans include about 3.5 hours flying time to our destination, then clearance at the Galapagos customs (because it’s a reserve it has its own clearance) and then identify our bags, and they go to the hotel while we head out to see if we can see some tortoises. It should be a exciting day, even if it’s a long one. 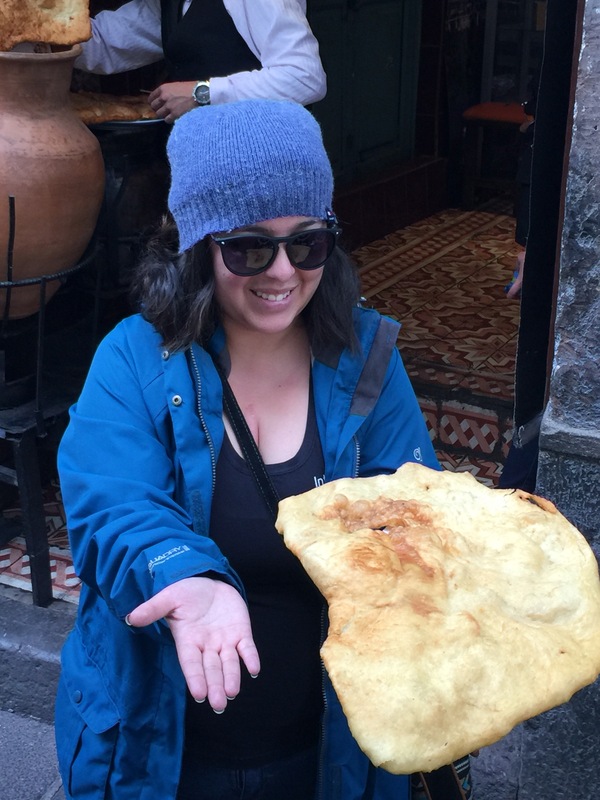 Our guide took the troop to an Empanada place, where several of the group tried this deep fried flour dough stuffed with chees, and sprinkled with sugar. Clearly, these are made for sharing!! Also on our walk ( by the way it was supposed to rain and thunder today, and while it threatened at times, we lucked out with lovely weather 20C or so), the ever present winged Madonna was watching over us. 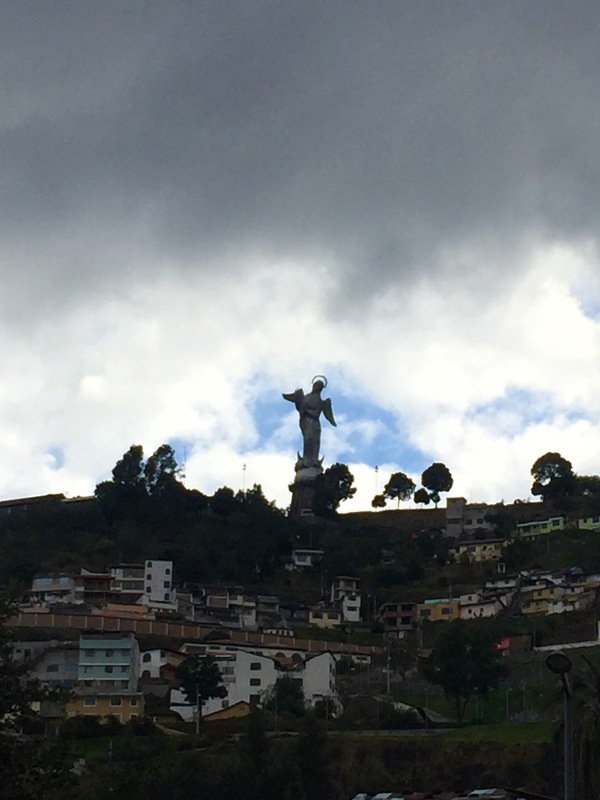 It is said that she was placed there to wrap the citizens of Quito in her arms and protect them from volcanoes. Not a bad idea since there are 2 or 3 active ones within site of the city! Our walk continued along to follow the street of the 7 crosses, passing many of the churches that we had seen previously. The rooftop of the Cathredral that Gwen and I visited yesterday is also impressive on the outside! 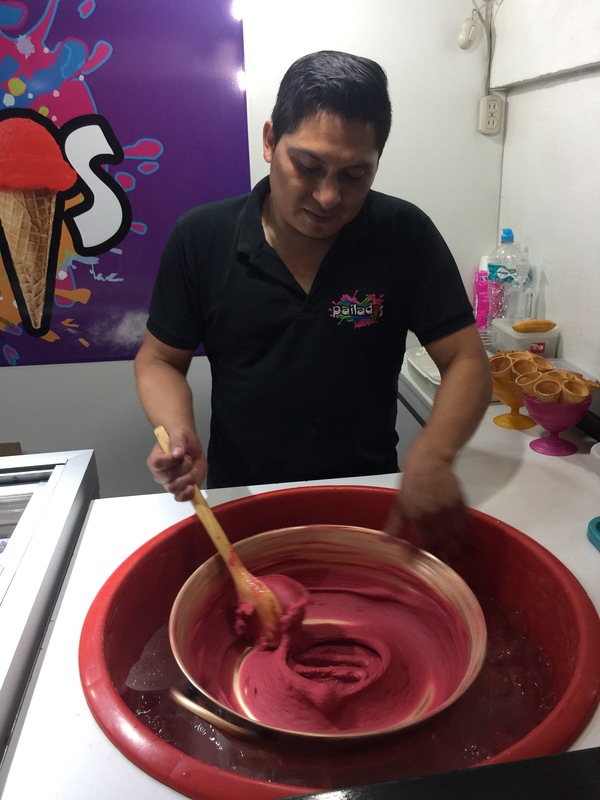 Our tour finished up with a bit of a gastronomic overview, ending with the making of Ecuadorian Helado. Here’s the master hard at work! Most of the flavours were predominantly local fruits… delicious! After a toast, and lots of exiting planning for tomorrow journey, we finished up our wine, and headed out for a lovely supper. Then back home again to try the reconfigure packing so that Dan and I could live out of one suitcase for the next 8 days, letting us park our mountain hiking gear here at the hotel until our return. Challenge accomplished, and we’re ready for bed…I’m sure I mentioned an early wake up!!! Well, my friends, it’s time to call it a night. I hope to publish from the Galapagos, but we’ll have to wait and see. 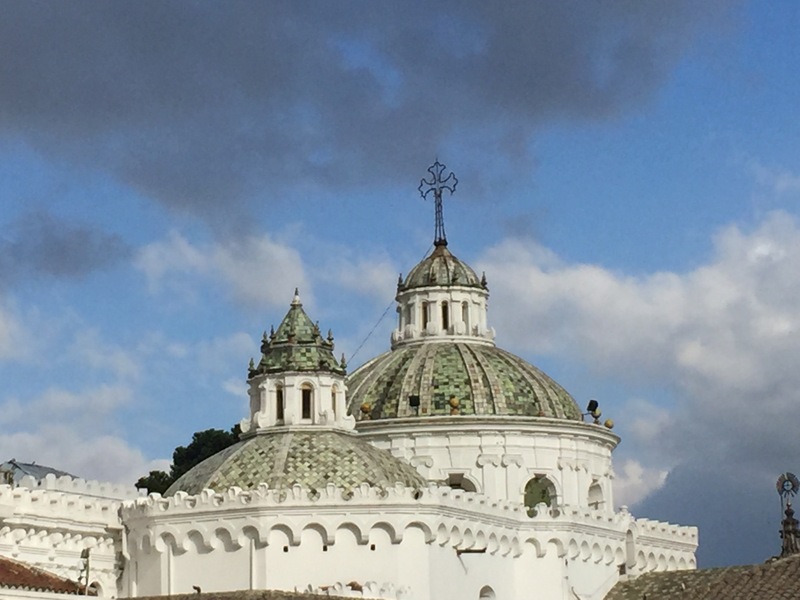 I promised to give you lots of details upon our return to the mainland! We are scheduled to do that! Hopefully all the sea life we encounter is friendly!! Thanks Pete! It’s definitely a must do thing. The touring company that we are on is great! I highly recommend a land based program as you gets lots of hiking in as well as the snorkeling!